CORD hints at blocking Uhuru Kenyatta from race . The Opposition has threatened to move to court to challenge President Uhuru Kenyatta’s suitability to defend his seat, escalating a row over how Jubilee won the 2013 presidential election. Siaya Senator James Orengo on Sunday said the Opposition was reviewing fresh claims by a former Jubilee insider Onyango Oloo, against the evidence rejected by the Supreme Court during the unsuccessful 2013 presidential petition. “We are reflecting and reviewing what we have so far so as to see if we can make legal appeals on the basis of electoral fraud and misconduct,” said Mr Orengo. He was referring to the sensational claims by Oloo, who served as the secretary general of The National Alliance (TNA), the party on whose ticket Uhuru and Ruto were elected in 2013. 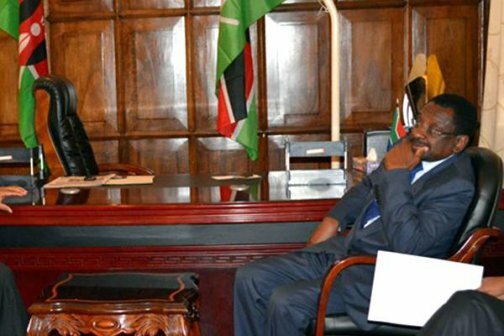 Last week, Oloo defected to ODM of Opposition leader Raila Odinga, who disputed his defeat by Uhuru in the last presidential vote. Orengo said it was impossible to use the current laws to remove the Jubilee government on these grounds, hence the only option was petitioning courts to have those who participated in the alleged malpractice blocked from participating in the coming elections. According to Orengo, if there are grounds for legal action, the Opposition will seek the intervention of the Ethics and Anti-Corruption Commission (EACC), the Directorate of Criminal Investigations (DCI) and the Director of Public Prosecution (DPP). They will then use the results from the agencies to petition the court to take legal action against President Kenyatta and members of his team. Nominated MP Johnson Sakaja addresses journalists. He denied claims by former TNA Secretary General Onyango Oloo that they helped President Uhuru Kenyatta rig 2013 elections. 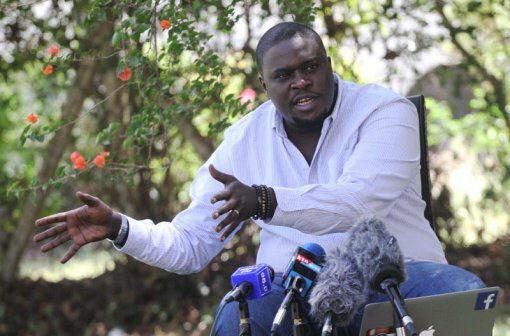 But nominated MP and former TNA chairman Johnson Sakaja denied rigging claims by Oloo and said President Kenyatta won the election fair and square. Nominated MP Johnson Sakaja addresses journalists. He denied claims by former TNA Secretary General Onyango Oloo that they helped President Uhuru Kenyatta rig 2013 elections. The Supreme Court upheld the election of President Kenyatta. Sakaja said Oloo was misrepresenting his role in Uhuru’s campaign team, adding that he was only in charge of the party’s administrative activities. Other Jubilee leaders attacked Oloo over alleged electoral fraud in the 2013 General Election, telling him to stop making false allegations against the President in order to win favour with Opposition chiefs. MP’s version Maara MP Kareke Mbiuki said Oloo was not involved in the move to get President Kenyatta to accept to run for high office in 2013 and instead gave his version of events. Mbiuki explained that there was a great deal of pressure for Kenyatta to step aside and support Musalia Mudavadi from a clique of powerful people from the office of the then President Mwai Kibaki. He said the race for the presidency in 2013 was not just about Uhuru as a person but also about concerns over the expected voter apathy from Central Kenya if Kenyatta was not on the ballot. Mbiuki said the leaders gave Oloo the top position because they were using him to give the party a national face. He accused Oloo, who intends to run for Kisumu Central parliamentary seat on an ODM ticket, of making the allegations because he was trying to remain relevant in his home constituency. Mukurweini MP Kabando wa Kabando said the allegations were grave and the question of Uhuru’s 2013 candidature was of great conjecture but Oloo was never involved. “UhuRuto being on the ballot in 2013 came about because I mobilised 46 MPs to make the all famous declaration and affirmation that Uhuru must be on the ballot box,” said Kabando. Meru Governor and Council of Governors Chairman Peter Munya said Oloo should desist from making alarming statements that are likely to trigger acrimony and unnecessary friction. But Mudavadi said he had been vindicated by the confession of the former TNA leaders. He said the confession had proved that the guilty are always afraid and have begun laying bare the sins they committed in 2013. “I feel vindicated as a victim of vicious deceit. It is my prayer that Kenyans vote this con regime out of power. The hour of reckoning is in August,” said Mudavadi. Suba MP and ODM chairman John Mbadi said: “I thank Oloo and Sakaja for coming out boldly to confirm what our fears have been. In future, individuals involved in electoral fraud should not just confess but also be jailed for denying Kenyans their democratic wish and allowing them to be governed by default.” However, Jubilee allied MPs in Kakamega led by Benjamin Washiali (Mumias East), Emmanuel Wangwe (Navakholo) and Bernard Shinali (Ikolomani) claimed Raila was using Oloo to lock out other aspirants for the Opposition presidential ticket. Speaking after attending a church service at Salvation Army in Kakamega town, Wangwe said sentiments by Oloo were schemes by Raila to lure voters on the premise that he won 2013 elections and he can still win 2017 elections. Some political leaders have called for the arrest and prosecution of Sakaja and Oloo for their role in the contested 2013 presidential elections. They also want thorough investigations carried out on the role played by the Independent Electoral and Boundaries Commission (IEBC) officials to punish those found culpable of electoral malpractice. Oloo was quoted yesterday detailing the intrigues that allegedly handed President Kenyatta victory in the last election. However, Jubilee Majority Leader Aden Duale said the party is focussed on the future. Supreme Court He added that the Supreme Court vindicated the Jubilee win and no other story will change the position. Kajiado North MP Moses ole Sakuda, a close ally of Uhuru, who was in his campaign team called for the arrest of the two. Machakos Senator Johnstone Muthama blamed the Supreme Court for the mess, pointing out that the court subverted the will of Kenyans. However, Kakamega Senator Boni Khalwale termed Sakaja and Oloo desperate. Mombasa Senator Hassan Omar and Kimilili MP Chris Wamalwa all supported the prosecution of former IEBC officials.